I think I’m about done with Chrome-specific tips for now, although if I see something that looks interesting I might put something together. I’m going to finish up this short series with a quick look at some handy Google features that are designed with Chrome in mind (in that they’re all easy to get to and use in Chrome). Specifically I want to look at Google’s cloud storage feature, Drive, and some related applications. Drive is basically a place to store files in the cloud, where you can get to them easily. Think of it as a disk drive. You can create folders in much the same way, and organise things the way you want to. It’s great for keeping safe backup copies of important stuff from your machine. And all those files can be accessed from any machine you’re logged in from – so you can upload files from your laptop then get to them from a tablet, say. By default only you can see your files, but you can also share files and folders with anyone you choose to (and you can choose to give certain people read-only access if you like). Sharing brings with it the ability to collaborate on things with others – family, friends, clubs, work, and so on. To get to Drive (and most of the related apps I’m coming to), open a new tab then click the app drawer symbol. That opens your Drive as a web page where you can see what you have, create folders, and so on. To upload a file, click the red New button and select File upload. Easy. There are a bunch more things on that page, but I could spend a week writing about them all. Just explore. You’ll get it. Now, before I go any further, I’d better explain that there’s a difference between Drive the feature, and Drive the application. The feature is just as I described – safe storage on Google’s servers, accessed through your web browser (or mobile apps), and “owned” by your gmail account (that is, the files are associated with you as owner through the gmail address that identifies your account – the one you’re signed into Chrome as). The application builds on that. It’s an executable that you optionally download and install on your Windows PC or Mac, and it lets you link folders on your machine’s hard drive to your Google Drive storage. At that point, any changes you make to any files in those linked folders are kept in sync with the cloud. If you lose your Internet connection, you can continue to work with the local copies and they’ll get synced up when you’re connected again. There are some related apps that let you create and edit files right there in your Drive folders, using Google’s own file formats. Docs is basically a word processor. It’s not as fully-featured as Word or OpenOffice, but it’s great for basic stuff and perfectly adequate for letters and manuscripts. And you can download a local copy of the file in various file formats such as Word and HTML. Sheets is a spreadsheet application, and it’s surprisingly powerful. Slides lets you create presentations as a set of slides (think PowerPoint). There’s also Forms, which lets you create, duh, forms, for surveys or whatever. What’s really cool about Docs and Sheets is the collaboration feature (and this probably applies to Slides and Forms, too – but I haven’t tried that – and it might very well be true in other apps such as Google Drawings). When you share a document with someone else (or several someone elses) and others have it open at the same time, you can see who else is working on it. You can see other people’s cursors, colour-coded. When one person makes a change, everyone else’s screen updates right away. You can demonstrate it yourself if you have two machines (a laptop and a tablet, say) logged into the same account. Create a document on one machine, then open it on the second machine too. Now as you change the document on one machine, the view on the other machine changes. IS THAT COOL, OR WHAT? Not only that, but you can open a chat window so that you and your collaborators can talk to each other as you work. That means that a group of people can work on a text document, or a spreadsheet, etc., and coordinate what each other are doing. Now, that’s collaboration. 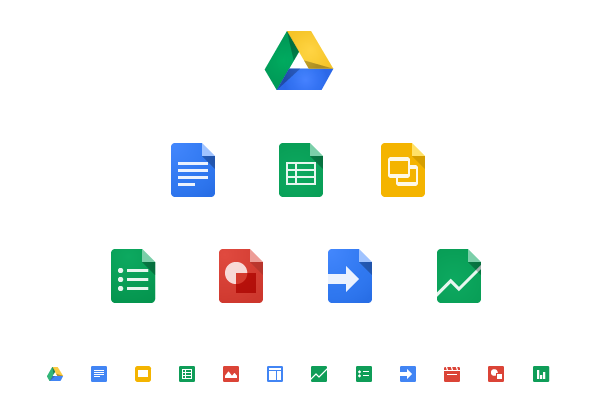 There are a lot more Google apps available. Open that app drawer again. You have some apps right there. Click More at the bottom and you’ll see (wait for it) more. (And by the way, you can drag and drop things here to move the ones you use most to the top section and get the ones you don’t use so much out of the way). And at the bottom there’s a link that says Even more from Google, which opens a page with links to a whole herd of Google apps. News, books, maps… Remember the trick from a few posts back, where you can add a web site as an app? (Hamburger, More tools, Add to taskbar.) Pick the apps you can use, add them as apps using that trick, and then you can fire straight into them using the App launcher. Google Keep is really useful. Create notes and lists (I use it for shopping lists, among other things) and have them available on your phone. Neato. Google Calendar – I don’t know how I’d manage without this one. Google Translate – very useful from time to time. Google Sites – create web sites and wikis. Well, actually, I haven’t used it myself but I’m planning on trying it out just to mess with it and see what it can do. THE previous Chrome Tips post was about apps. In this one, I’d like to talk a bit about extensions. IE Tab: this one lets you open a web page in a tab using Internet Explorer’s rendering engine instead of Chrome’s own. That can be useful for viewing pages that were designed specifically for IE, and that don’t render properly in other browsers. These days I don’t have much need for it but I keep it around just in case. And, I don’t know how Microsoft’s new browser, Edge, fits in since it uses another rendering engine altogether. Forecastfox: That’s a weather extension that tells me the current weather and temperature. The background on the temperature changes to red when there’s a severe weather warning. Adblock Plus: Does just what it says – it blocks ads, which can speed up page loads. But it does more than that; it also blocks tracking cookies and a certain amount of malware, which is the main reason I use it. Pinterest: Gives you a quick way to pin a page to a board on your Pinterest account. You get extensions from the Chrome Web Store, just like you do for apps, and you install them in pretty much the same way. Explore the store – there are lots and lots of extensions for all kinds of things. Like I said, not all extensions have icons, but you can see all your currently-installed extensions easily. Quick way: right click on any icons you already have in that area and choose Manage extensions. If you don’t have any extension icons, then go to the Settings page and click Extensions on the left side. You’ll get a page with all the details. Here you can remove extensions easily (just click the garbage can icon). You can also disable extensions – useful if you have one that you want to switch off for a bit but you don’t want to remove. Some extensions (like Forecastfox) have customization options, and you can get to those by clicking the options link. Last word: if you have multiple accounts set up (as I explained in an earlier post), each account has its own set of extensions. So if you sign in on a new machine, your extensions are installed for you automatically. Nice. APPS are things that you start when you want them to, and they typically run in their own tab or window. Extensions, on the other hand, modify Chrome’s behaviour more generally. This post is about apps. I’ll come to extensions in the next post. To get to your apps, click the Apps button—it’s usually at the left hand end of the bookmarks bar. Oh, wait. You don’t see that on your Chrome? Right click in the bookmarks bar and click the Show apps shortcut setting to turn it on. Oh, hang on. You don’t even have the bookmarks bar? Click the hamburger button then mouse over Bookmarks, and you’ll see the option to switch on the bookmarks bar. Or just hit Ctrl-Shift-B to toggle it. And there’s another way to get to apps, which is the Apps Launcher. This is installed for you (either when you install Chrome, or it might happen when you install something from the store; I don’t remember for sure). You can get to it on Windows by clicking the Start button, going to the installed applications, and looking under the Gs. You should be able to drag it to your task bar or pin it to the start menu. When you open it, you’ll see a grid with the icons of all your apps, and you can open them right there. Where were we? Right, getting to your apps. Click the Apps button and you’ll see a page with your apps. One that should be prominent is the one for the Chrome Web Store. That’s useful to have, because the store is where you can get more apps and extensions. In fact, do that now. Go on, click it. There are all kinds of apps for all kinds of things. There are games, of course. Lots and lots of games. But wait, there’s more. Productivity apps (including the ones Google provides, of course) like spreadsheets, and calendars, and text editors, and lots more besides. You have a Netflix account? There’s an app for that. Want to read books? There’s a Kindle app that lets you read books from your Amazon library, and of course there’s Google Play Books. Explore the store and you’ll see what I mean. Many of the apps are free, but there are a few that cost a little bit (if you find an app you’d like but it’s not free, the best thing to do is get a Google Play Store card. To add the funds to your Google Wallet account, follow the instructions printed on the card). Adding an extension from the web store is easy. Pick one you want, and click it. A popup will pop up, and there you have the option to Add to Chrome. Click that, confirm that you want to add it, and it’ll download and install itself. That’s it. You don’t have to restart Chrome; the new app should be on your apps page and you can use it right away. Sometimes apps open in a new window, sometimes they open in a new tab. You can control which. Go to the Apps page, right click on the App, and you can check or uncheck Open as window. Removing an app you no longer want is easy, too. Right click on the app and select Remove from Chrome. You can also set web pages as apps (in fact, some of the apps aren’t really anything more than a link to a web site). To do that, get the page open in a tab, then click the Hamburger button, mouse over More tools and then select Add to taskbar (I know – not really obvious). Choose whether to open as a tab or window (you can change that at any time, as I described earlier), and save. Now it’ll show on your apps page. Last thing: Remember the earlier post, about signing into Chrome? When you sign in on another machine, your apps will usually get installed on that machine right away so you have them available. Cool, huh? I have several gmail accounts. I use one for book-related things, another for day-job stuff, and so on. Having separate accounts for separate concerns makes things much simpler. And Chrome makes it easy to keep those accounts distinct and switch between them. It’s also useful if you share a machine between several people. To add a new account, click that button at top right, then Switch person. Dialog opens. At the bottom you’ll see the option to Add person. Click it, and a fresh Chrome window appears. Now you can click the gmail link and create a new account, or sign in to an existing account. Or you can not sign in if you don’t want to. To remove someone from the machine, left click the name and choose Switch person. Mouse over the person you want to remove, and a drop-down arrow appears at the top right of their picture. Click that arrow and you’ll have the option to remove that person’s information from the machine completely. I like Chrome. In fact, I’m quite a fan of Google in general. I love the way the different parts interweave to make so many things simpler. Things that just a few short years ago, were difficult to do. Like being able to upload a file to Google Drive and then share it with others, or access it on my phone when I need to. Or being able to set appointments on my calendar on the web, and have it remind me on my phone. I sometimes get asked questions about how to do this or that in Chrome, or Drive, or Keep. Somehow I seem to have become a go-to-guy for those kinds of questions—although I don’t really know why, because I don’t consider myself an expert by a long stretch. All the same, there are some questions that get asked pretty often. So I thought I’d start a series of short blog posts about some of those things. And that’s what this is all about. Shall we begin, gentle reader? WHY should you sign in on Chrome? You don’t have to sign in. And there are times when it would definitely NOT be a good idea. For example, signing in on a public computer at school, or at the library, or in a shopping mall… well, just don’t. Like I said, you don’t have to sign in. You can still use Chrome as you would any other browser. But if you do sign in… well, a whole bunch of things just got easier. All your bookmarks, for example, get synchronised on Google’s servers—Chrome uploads them for you. And then, if you sign into the same account on another machine (including Chrome on Android devices), those bookmarks and a lot of other things get downloaded into that copy of Chrome and can be used right away. No more messing with exporting and importing bookmarks and all the rest. And if you sign out, all that account-specific stuff gets wiped off the machine, nice and safe. How do you sign in? Easy. All you need is a gmail account and password. If you already have gmail, skip down to ***. If you don’t already have one you can set one up in Chrome. Just open a new tab. At the upper right you should see a link to gmail. Click it. Sign up. That’s it. … do I? DO I? *** If you already have a gmail account, you use that to sign in on Chrome. (In fact, if you just signed up you should check to make sure Chrome signed into that account at the same time.) To do that click the Hamburger button at top right, click Settings, and check the Sign in section at the very top of the settings page. It’ll tell you if Chrome is signed in. If not, go ahead and do that using the gmail address and password. In the next post: Multiple accounts.